Over the period the project has delivered 24 meetings between the adult partnerships involved. All of the groups have taken part in workshops and site visits on a wide range of topics including some of the following; Cultural Diversity, Customs and Traditions, Christianity, Plantation, The Establishment of the Border, and Prejudice. 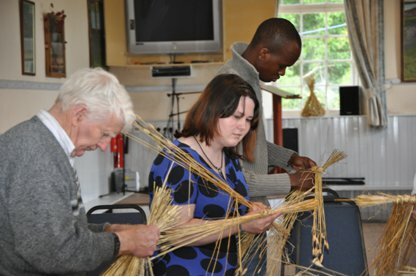 An adult partnership making traditional straw costume. The adults have all undertaken different pieces of work arising out of these workshops. This ranges from quilted portraits on the theme of how others see us to the production of a digital sound archive on the theme of negative racial, mental health, and sectarian prejudice. The groups have also taken part in the creation of a series of sculptural art projects around the theme of peace as well as creating their own peace banner. 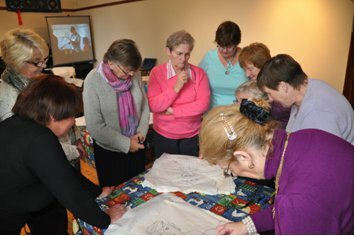 Some ladies from Bruskey and Belleek exploring the topic of ‘how others see us’.